A new tarot based on shamanic imagery that invokes the magic of nature, numbers, and imagination - Works with colorful primal symbols and vivid natural images to explore the soul's primal roots and its relationship to sacred geometry and nature - Uses tribal memory and symbolism as ways to connect with our own dreamworld, power, and creative potential - By the author of the bestselling Inner Child Cards (more than 100,000 sold) This innovative 78-card tarot deck calls forth a shamanic presence through its evocative imagery of primal symbols and tribal art forms from earth mythology and folklore. The potent journey mapped out in the deck has roots that reach into our ancient ancestry, encouraging us to feel and dream as a means to contact the unconscious forces of life. Through this journey we can develop a conscious understanding of the magic of nature, which allows us to unlock creative potential. 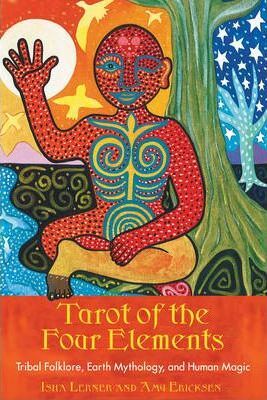 Tarot of the Four Elements prepares the soul for a magical exploration of the dream world using images that span cultures, races, and religions, including masks, totems, stars, handprints, and various symbols representing the natural world. Artist Amy Ericksen invites the mind and heart to dance into the images, and with that dance, to find a stillness and depth. Her paintings invoke the magic of nature, imagination, and the human spirit in order to stimulate our own power and creativity.